We pay cash for cars, trucks and SUVs, no matter what their age or condition. We always pay top dollar, provide free car removal service, and can usually have cash in your hand within one business day. Kelly Car Buyer is a family owned and operated business serving Central Florida. Whether you're in Sarasota, St Petersburg, Clearwater, or Orlando, we're interested in buying your car. If you're just done pouring money into repairing your old truck, we're interested. If you are tired of looking at the junk car leaking oil in your driveway, we'll pay you and pick it up usually the same day. Or if you simply need some cash fast because of a family emergency, we would appreciate the opportunity to talk to you about the vehicle you want to sell. We've worked for years to make the whole process as simple as possible for our customers. First, Contact Us in whatever way is most convenient. You can call us or fill out our simple online form. We just need a basic description of the car, truck, or SUV you are looking to sell. For example, make, model, age, mileage, and general condition is all we need to start the process. We'll then quickly be able to make you the best cash offer possible. If you accept, just tell us where and when to pick up and pay you for your vehicle. It really is that simple. 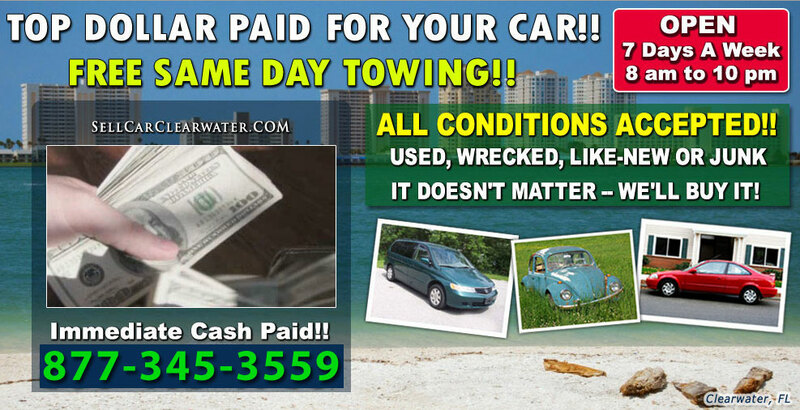 We never use the kind of hidden fees or deceptive practices that are all too common among so-called junk car buyers. We always show up on-time and with the promised cash or check in hand. Thanks for taking the time to visit our web site, and please don't hesitate to contact us if you have questions or concerns.